Short on time? Follow this link to a Google Maps version of our London itinerary with all of our favorite spots labeled! You can “follow” the guide, and the saved locations will automatically transfer to your own Google Maps account. After kicking off our trip with two days in Dublin, relaxing for two days at a castle in the countryside of Ireland (including a mad dash out to the Cliffs of Moher), and exploring Bath, England for just one full day, we wrapped up our trip with four days in London. Tyler and I have a tradition every time we fly home from a trip: we order sparkling water and go through the entire trip and decide what we loved and want to include on our guide to the location. I usually keep it in a note on my phone and then pull it over to a Google Doc when I sit down to write the blog post. As I transfered our bulleted recommendations from London into this doc a few minutes ago, I nearly had a heart attack because the list is longer than the lineage of Jesus in the Gospel of Luke. Don’t worry, though, I just got some water and I’m ready to tackle it. This simply goes to show that we had an incredible time in London and fortunately have many, many recommendations to share in this post today. Despite numerous trips to Europe, this was somehow both of our very first times in London. We also had my little sister Miriam with us, which was a fun twist for Tyler to deal with. Looking back at our four days in London, I have mixed feelings. On one hand, we fell in love with the city and found so many amazing spots during our time there. But we also experienced something really scary one night when we were out that I’ll do my best to summarize before we get into the guide. You can read more details about what happened here, but we found ourselves caught in the middle of a terror scare one evening on our way to dinner near Oxford Circus. We turned around to see hundreds of people running, screaming “shooter!” and diving into shops and restaurants for cover. Tyler, Miriam, and I ended up on lockdown in a restaurant basement for two hours as news and social media reports of an attack circulated and repeated waves of panic reverberated through the street above us. Thankfully, it all turned out to be a false alarm, but we were absolutely terrified during the incident (except Tyler, of course, who took on the role of traffic director and police liaison without hesitation). Miriam and I both had a tough time shaking it off the rest of the trip. In a way, the incident made me love London even more because we experienced first-hand the tension the city has developed over the past year following the handful of tragic attacks the UK has endured. I’m also grateful for the not-so-cheesy-anymore reminder to hold my loved ones even closer. My heart stops at the idea that something terrible could have actually happened that night, and I have nothing but compassion and admiration for the strength that the UK has shown in the face of such tragedies this past year. In our opinion, London requires more than just a couple of days to conquer. We spent four full days exploring and still barely scratched the surface. We often feel the pain of the double-edged sword of big cities: they are too big to uncover in a couple of days, but it’s expensive to stick around for much longer. If you can, shoot for at least three, if not four, days. To reiterate, although I’m sure you’ve heard, London is ridiculously expensive. The museums, food, and transport will certainly cut deep into a trip’s budget. So plan accordingly. As always, we took advantage of the Thanksgiving holiday and lull in corporate America for this trip (find more travel hacks for non-trust fund babies here). If we had complete flexibility, we would have gone a month earlier. While the weather–mostly in the 40’s–wasn’t unbearable, we wouldn’t have turned our noses up at slightly higher temperatures and a few more leaves still on the trees rather than under our feet. The Heathrow Express train makes getting into London a breeze. A round trip costs £37 (like I said, pricey) and takes just fifteen minutes each way between Heathrow and Paddington Station. We bought our tickets at the airport, but you can purchase them online beforehand if it will help you sleep better. Definitely invest in an Oyster Card for the “Tube” (aka the subway system) that you can use to easily get around the city. We found Google Maps to be VERY helpful in London and used that to show us which lines we needed to take, although a lot of people rave about the CityMapper app, too. I’m sure there are a bunch of great neighborhoods to stay in, so this is just our experience here. We really loved our Airbnb in Earl’s Court–follow this link to get $40 off your first stay. The area was safe, quiet, and just a few minutes’ walk to the tube station and the gorgeous neighborhood of Kensington. If you do decide to stay in Earl’s Court, make a reservation at Churchill Arms, a greenery-covered pub that doubles as a Thai restaurant. Grab lunch at Borough Market and walk the River Thames. Stroll along the River Thames for an overview of some of London’s most iconic sites. Since this walk will take a while, we suggest fueling up at Borough Market. Be prepared–Borough Market is extremely overwhelming. You will undoubtedly feel panicked and paralyzed by the amount of choices. And I’m not here to control that choice, but if you know what’s good for you, you will RUN straight to Kappacasein Dairy for a “cheese toastie” (aka the best grilled cheese you will ever have the privilege of consuming). This sandwich was honestly one of my favorite things I’ve ever eaten, maybe ever. Humor me and try one. If you find yourself with room for more, grab a pour over at Monmouth Coffee or a donut from Bread Ahead. After lunch, make your way over to the London Bridge to begin your walk. Along the walk, you’ll see the Globe Theater, St. Paul’s Cathedral, Big Ben, Parliament, and the London Eye. A friend recommended this walk to us, and we loved seeing the city like this on our first day. Note: Big Ben will be under construction until 2021, so take that into account when planning out your Instagram feed. Most of major landmark spots in London are expensive, so bear that in mind while mapping out your itinerary. A few of the standouts are Westminster Abbey, Buckingham Palace, and the British museum. Depending on your crowd tolerance and ticket budget, we suggest choosing just a couple that are the most interesting and settling for a picture from the sidewalk for the rest. Raise a pinky at afternoon tea. The idea of afternoon tea makes a lot of sense to me: it’s 3pm, I’m drowsy, and my 7pm dinner reservation may as well be next September. Enter a convenient, light, and classy snacktime to gently lift me over the hump and give me enough energy to make it to my next meal. We learned that afternoon tea started in 1840 when the Duchess of Bedford had finally had enough of the mid-day slump and started inviting guests to her room for a secret snack and tea time. My kind of woman. In our opinion, afternoon tea is a cultural staple and a nonnegotiable bullet on any London itinerary, but you do have some options in terms of pricing. If you’re ready to ball out, we recommend Sketch. We stopped by for a cocktail one evening and walked through the insanely decorated and completely pink tea room with our jaws on the floor. If we were to splurge on “high tea,” we’d definitely do it here ( £72 per person for tea with champagne and £58 for just tea, but let’s be honest…). We opted for a less expensive but still lovely option at the Orangery at Kensington Palace for around £30 each. Double check to make sure it’s open, though, as the last time we checked, the restaurant had temporarily closed for refurbishments. See a show on the West End of London. I’ll never forget the first time I dragged Tyler to a musical on Broadway last year in New York. He hemmed and hawed the entire day leading up to it. Like the genius I am, though, I chose Wicked for his indoctrination to the world of theater. Two hours later, he walked out of the Gershwin Theater, Elphaba souvenir cup in hand, whistling “Popular” and covertly glancing around, no doubt trying to catch a glimpse of any stray cast members leaving the theater. Now, you’d think he was an heir to Sondheim himself with the way he raves about his love for musicals. I didn’t run into any issues when I suggested seeing a show on the West End in London. Tragically, however, our plans to see The Book of Mormon fell through due to our lockdown in the restaurant the night of the Oxford incident. We had close friends visit London shortly after we did, and they managed to score really cheap lottery tickets to two different shows. You can find lottery details on each show’s website. We ate out in Soho, one of London’s busiest and most vibrant areas on the West End, a couple of different nights and really loved the area. If you aren’t willing to shell out the cash to have afternoon tea at Sketch, we recommend stopping by at least for a cocktail. There are a few different bars, but ask the host to point you in the direction of The Glade for a quick transition to what feels like Alice in Wonderland on steroids. It’s SO cool. And make sure to use the restroom while you’re there. I won’t ruin the surprise any more than that. For dinner, we recommend Shoryu Ramen, most ideal on a cold night. For an inexpensive and delicious pizza stop, definitely make sure to eat at Princi Pizza. Choose from countless pizza options, order at the counter, and pay by weight. We LOVED this place. End your night at Gelupo Gelato, and cab home in a food coma. Spend an afternoon at Harrods and in Hyde Park. Harrods, a designer-lover’s shopping mecca, is overwhelming, to say the least. Miriam and I somehow lost Tyler in this massive department store and found ourselves trying on million dollar rings on the fine jewelry floor (the sales associate’s idea, not ours, I promise). The decor alone is worth stopping by–don’t miss the Egyptian-themed escalator situation. Recover from the madness of Harrods and get some fresh air at Hyde Park nearby. Feeling particularly ambitious? Use this self-guided walking tour we found, and make your way through the park’s historic landmarks. Embrace your basic side, and plan to spend a day exploring Notting Hill. I also recommend watching the movie to refresh your memory of the area (and of Hugh Grant in his prime) before your trip to London. Not only are the vibrantly-colored houses even more gorgeous in person, but Notting Hill has so many cute spots worth discovering. Begin your day at Portobello Market, and browse the stands full of antiques and souvenirs. Grab breakfast at the Australian Farmgirl Cafe, and order the avocado toast with poached eggs. Then, make your way to The Notting Hill Bookshop, the shop that inspired the store in the movie. Did I buy not one but two books and beg the cashier to stamp the inside? Yes. And you should, too. Thirsty? I’m a sucker for JOE & THE JUICE, right on Portobello Road (double-checked, yes they capitalize the whole thing). Check out Lancaster Road, a strip of brightly-colored townhomes. 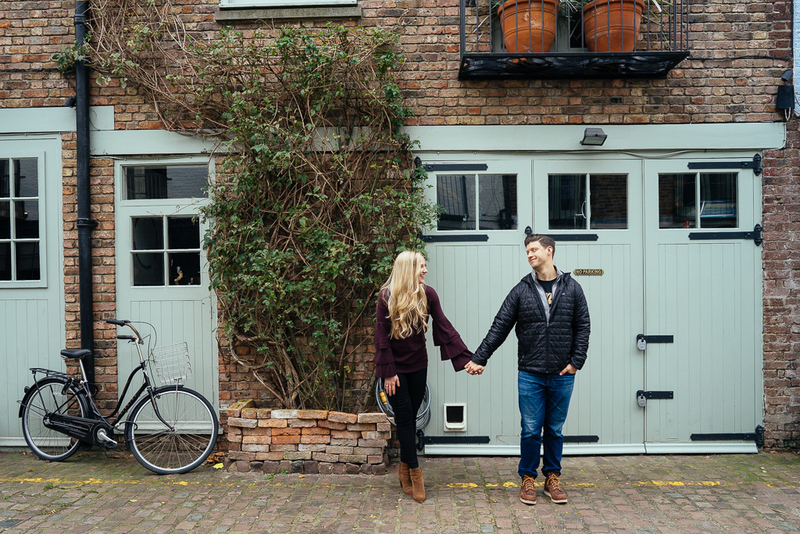 And don’t miss our favorite street in Notting Hill, St. Luke’s Mews–perfect for a photo op! If you stay in the area for dinner, we recommend Saporitalia and then a swing through 3Bis Gelato for dessert. Visit the Churchill War Rooms. The Churchill War Rooms came highly recommended by a handful of friends. This museum was built in what was once Winston Churchill’s secret underground headquarters. Churchill spent almost the entirety of WWII commanding from these war rooms. The first half of the museum details the history and function of the bunker and how Churchill’s team strategized to defeat the Nazis, communicating with the rest of war-torn Europe above them. The second half walks through Churchill’s life before and after the war. We loved this more than pretty much any museum we’ve been to in Europe and can’t recommend the experience enough. Be hipster for a day in Shoreditch. We took the tube over to artsy and eclectic Shoreditch one day because a few people told us it was the place to be. And was it ever. Full of hipsters and street art, we did our best to fit in and ordered pour overs at Barber & Parlour. Check out all of the vintage shops and people-watching that Shoreditch has to offer. If you need a snack, hit up Boxpark, a two-story market full of great order-at-the-counter restaurants and twinkle-lit seating. Browse for books, and grab just one more coffee. This last one is one of my favorite recommendations for London. But first, let your travel partner grab a warm drink to sip on at Prufrock Coffee so you can book-browse in peace. Be sure to check out the art display of stolen spoons on the wall. Persephone is a book publisher that focuses on uncovering and bringing to life previously neglected works written by (mostly) women in the 20th century. The thoughtful, curated collection on display at the storefront is enough to reduce any book-lover to a panic over the idea of choosing just one volume to bring home. I mentioned this publisher in our recent “In-Flight Reading” Winter list, as I gobbled down the book I purchased here in a matter of days. (Little Boy Lost by Marghanita Laski, available on Amazon via Persephone). This is a MUST for any book lover. We had an amazing time in London and now consider it an essential stop on any European itinerary. If you found this London itinerary helpful, relevant, or entertaining, we’d absolutely love it if you chose to follow along on Instagram. Absolutely love your writing style, so funny and informative! Also appreciate you sharing a more challenging part of travel! Thank you for the kind words! That means so much to us. Best week of my life. Can we go back now? Great post! Do you have any recommendations for where to stay in London? Hi Andrea! Thanks for stopping by! We really loved our Airbnb in Earl’s Court. Loved this post, so many great recommendations. The photo’s you have taken are amazing as well and I loved reading about your adventures. I just wanted to suggest for anyone thinking about visiting London that using the Tube to get into the centre from Heathrow can be cheaper than the Heathrow express as well as taking you straight into the centre on the Piccadilly Line. Costs roughly £6. Thank you so much for the kind words, that means so much to us! And that is a really great tip! We love any chance to save money, especially in an expensive city like London. Thanks for the advice! K just read this again and so excited to go in October now!!! Great photos! May I know what camera are you using?